Following the announcement of the Trychaser 2000 in the S.I.C. 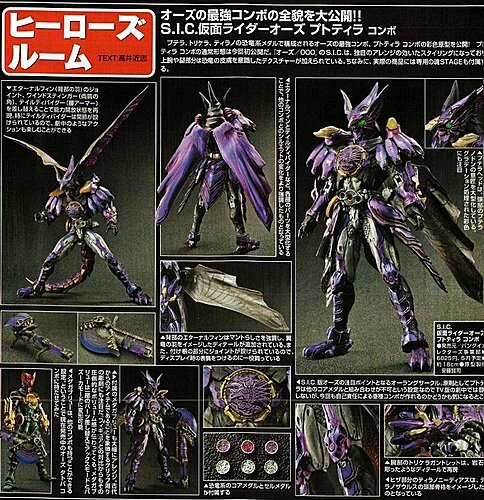 Kiwami Tamashii line, this month's issue of Hobby Japan features the S.I.C. Kiwami Tamashii Kamen Rider Kuuga Rising Mighty and Rising Beat Gouram. As of the moment Bandai only released images of the figures in its prototype stage. Release date and price has yet to be announced as of this post. Another feature from this issue is the S.I.C. Kamen Rider OOO Putotyra Combo first seen during the Tamashii Nations 2012 event. 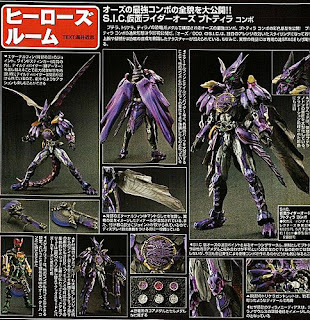 Towering at 180mm, the figure is inclusive of 3 Core Medals namely: Ptera, Tricera, and Tyranno, an extra tail, 3 Cell Medals, interchangeable hands and his weapon of choice, the Medagaburyu. This S.I.C. is set to release this May at 6,500 Yen.